Several people have asked my opinion on how to travel in India right now because of the currency situation, here is my humble advice: come with patience! If you have booked with a tour operator or directly from not-too-bad-hotels, you can pay by card and keep your small change (which is worth gold) to buy a bottle of water, a chai, a rickshaw fare etc. 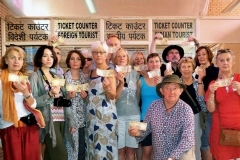 Legally, foreigners are allowed to exchange only 5,000 rupees a week – which is enough pocket money if you pay for lodging, transport (bus/plane/train) and beers by card. Technically, no one can check how much you exchange per week unless you go to the exchange bureau of a chain. There is the option to go directly to the counter at the bank. Here again you must find the Bank that has cahs and it’s not easy easy. Then wait in line. And with a little luck you can withdraw 24,000 rupees (per week, wherever you withdraw, at the counter or the ATM). Finally you can take an Indian SIM that will last 3 months. It is not always the easiest experience, but it does get you into the swing... (Apparently in September the Government agreed that all the tourists with an e-visa will automatically receive a SIM card but I can't seem to find out whether it has actually been implemented). You need to come ready with a photocopy of the passport, your visa and a photo. Plan to activate a card with roaming (if you change State) and data to have wifi. And if you get that far and you have previously downloaded the app PAYTM (and recharged your account) you should be able to make a lot of payments with your phone! Uber or Ola app can also be useful.